With a few notable exceptions, Indian/Pakistani eateries in Utah tend to look pretty similar, like they were shaped from the same business plan. The menu offerings tend toward the predictable, as do the standard all-you-can-eat lunch buffets and sitar music that plays softly in the background. But every now and then, an establishment comes along and shatters the mold. Such is the case of Karma Indian Cuisine in Sandy. For starters, Karma, though located in an unremarkable Sandy strip mall, looks like a snazzy restaurant/bar. Walking through Karma's front doors brings you into a fashionable and beautiful space. The lux interior was designed by Marikh and Mehwish Obaid, daughters of Karma owners Fazel and Roma Obaid, who also operate Aroma restaurant in Draper. Tables and booths are nicely spaced, aren't crowded or cramped, and modern chandeliers and hanging table lights cast artsy shadows on the walls. There's also an attractive contemporary bar that serves as the visual centerpiece of the restaurant—again, something I'm not used to seeing in most Indian dining venues. However, as appealing as Karma is to the eye, it's the cuisine that will keep you coming back. I've never especially wanted to live in Sandy ... until I tasted the Karma korma, that is. But more about that in a bit. I was a bit puzzled by the wine service. Karma serves wine and beer, but the wine selection is a tad skimpy and we had brought our own bottle to the restaurant, fully expecting to pay a corkage fee. But instead, we were charged $6 per person for the use of two wineglasses, which showed up on our bill as two Pellegrinos at six bucks apiece. Odd. That, however, was the only service glitch of the evening, which began with an order of stuffed naan. The traditional Indian flatbread is baked in a clay tandoor oven, nicely puffed and charred around the edges, and stuffed, in this case, with minced and lightly spiced lamb ($5). There are also onion, garlic, chicken or saag (spinach) varieties available,. The lamb naan was luscious, and I thought the dipping sauces—raita, mint and tamarind chutney—were outstanding. Other interesting starters include "deconstructed hummus" served with naan ($11) and spicy Bombay "frites" with cilantro and lime ($6), which are served with a mango compote. So, that korma I mentioned earlier: City Weekly dining contributor Amanda Rock counseled me to try the Karma korma, saying, "My god ... I want to bathe in it." So I did—order it, that is. And I didn't want to bathe in it so much as connect some sort of food delivery device to my maw that would pump that killer korma into it on a continual basis. It was divine. We ordered korma paneer ($16), which is a housemade South Asian-style cheese curd with a tofu-like consistency and texture. It was bathed (as Ms. Rock would like to be) in a stupendously delicious and silky korma sauce made with coconut milk, curry spices, ground cashew nuts and golden raisins. Entrees at Karma are prepared, as requested, in mild, medium, hot or extra-hot ("at your own risk") variations, and the medium-spicy korma was spot-on in terms of spice level. I can never resist vindaloo, the traditional curry dish of Goa, when I see it on a menu. Like the korma, the vindaloo at Karma was superb. 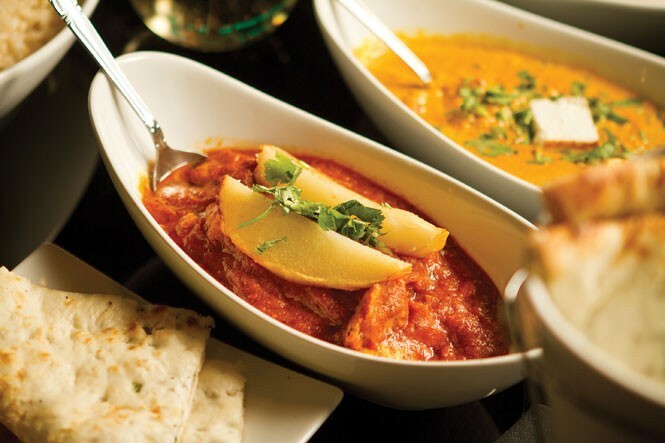 The tanginess in vindaloo comes from vinegar, which is blended with curry spices and made into a fiery (I ordered mine hot) sauce ladled over tender boneless chicken pieces and potato. I didn't really like the potato presentation: a single spud sliced in half, lengthwise. I'd have preferred bite-size pieces more evenly cooked. But the vindaloo flavor and the chicken were terrific. The only real disappointment was shrimp biryani ($17). It was basmati rice cooked with golden raisins, cashew nuts, charred onion and spices, and the flavor was fine. But, for 17 bones I'd expect more than the not-so-generous handful of tiny, flavorless shrimp that went into the dish. There's another (unaffiliated) Karma I really like: Good Karma, located in the Prospector area of Park City. I've reviewed Good Karma in the past, and you can find my very favorable comments in the City Weekly archives. However, you might not be aware that one can purchase Good Karma chef Houman Gohary's Indian-Persian cuisine to go in the form of "Instant Karma" takeout products, available for retail at outlets such as The Market in Park City and at Good Karma restaurant. The last time I visited The Market, Gohary happened to be there stocking his products. A woman came up to him and said, "You make the best hummus I've ever tasted!" I wouldn't argue with that opinion; it's exceptional hummus. Other takeaway products from Instant Karma include saag with butternut squash and garbanzos, daal with spinach and tomato, gobi aloo masala (cauliflower and potatoes), naan, green chili chutney, cumin-scented basmati rice, aloo channa vindaloo (potatoes and cauliflower with vindaloo sauce), eggplant dip and more. Personally, I just can't get enough of that killer Karma. Sundance Sanctuaries: Finding great Park City grub in a paparazzi-free environment. Sweet Lake Biscuits & Limeade takes center stage.